Our superfood salad is so-called because it’s packed with nutritious and vitamin-rich ingredients. The addition of olives gives this salad a Mediterranean twist that is certain to bring some sunshine to your day. 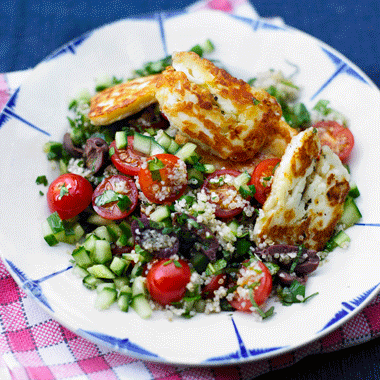 If you can’t find haloumi, use chunks of ungrilled feta instead and soak in the same way before adding to the salad. If you make too much salad you can easily transform it into a nutritious lunch the next day. Simply spread wholemeal pitta bread with some hummus and fill with Greek superfood Salad. Photo and recipe taken from The Balance Diet Cookbook. Cook the quinoa in boiling water for about 12 minutes – or according to the packet instructions. Drain and rinse under cold water. Meanwhile, soak the halloumi slices and olives in water for 10 minutes, to remove any excess salt. While the cheese and olives are soaking, place the couscous in a deep bowl and cover with the vegetable stock. Stir in the olive oil, and cover the bowl with cling film. Set aside for 5 minutes. In a bowl mix the tomatoes, cucumber, drained olives, parsley and mint. Add the quinoa and couscous and stir to combine. Whisk together the olive oil and lemon juice, and add half to the vegetables and grains. Drain the haloumi, pat dry, and place under the hot grill for 3 minutes on each side, until browned and crispy (alternatively you can dry fry them in a small non-stick frying pan for a minute on each side over a high heat). Divide the couscous mixture between 2 serving plates, along with the haloumi slices and drizzle with the remaining dressing. Season with black pepper and serve.